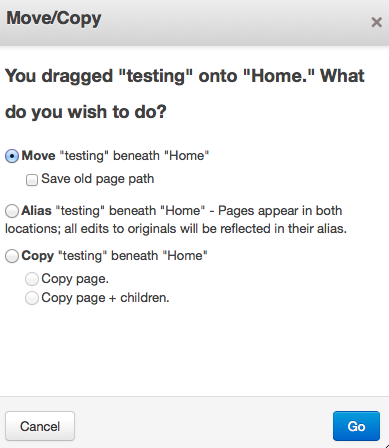 You can change a LOT of stuff very quickly using the Full Sitemap. To re-order navigations in your website, simply drag and drop the pages at any level. Click and drag the page icon, you will see a small line appear between two page names as you move your mouse around. As long as you're not moving the page to a new parent you will simply be changing the "sitemap order." Navigations like the Auto-Nav and Page List block will default to follow this order. If you drop the page on a different part of your site, you can actually move the page, make a new copy, or create an alias. Aliases are just pointers to the original location of the page. Visit - Simply takes you away from the Dashboard and over to this page on your website. Properties - brings up the page properties window without making you goto that page. Delete - getting the idea? Add Page - lets you add a page to the tree from right here. This is a great way to build out your basic site tree, you can go back later into each page to add content. Add External Link - if you want to include a link to a 3rd party site within your navigation, use this. Your entire Dashboard is actually built with pages in your site tree as well. Click Options, then turn on "Show System Pages"
The Sitemap will reload and you'll see a collection of concrete5 required pages for things like Login, Register and your entire Dashboard. If you're working with a bunch of people on the site, you can actually lock down differnet parts of the dashboard with different permissions. You will also notice a Trash page in the System Pages area. 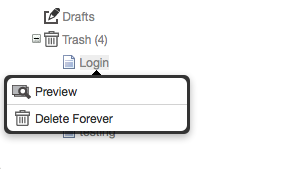 If you have accidentally deleted a page you can restore it from here. Simply move it back to your main site tree where you want it. If you need to restore a login page there is a great how-to for restoring a deleted page when you do not have access to the dashboard.